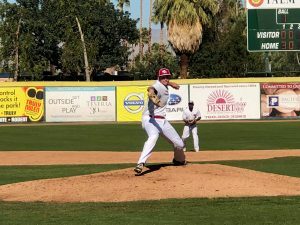 PALM SPRINGS, Calif. – The Palm Springs Power gained a full game in the American standings after defeating the first place Washington Blue Sox, 3-0 in game one at Palm Springs Stadium Thursday morning. Four Power (7-4) pitchers combined to throw a shutout in the victory. Kyle Brown got the start for Palm Springs manager Casey Dill and allowed three hits and struck out one over three innings of work. Dill has been impressed with the future Southern Illinois Miner left-handed pitcher so far this California Winter League season. Steven Baker (1-0) got the win in relief after throwing a shutdown fourth inning. Christian Colletti allowed one hit in two frames, and Tyler Sharp recorded his third save after facing four batters in the seventh. Shortstop Cletis Avery shined at the plate for the Power again, as the future Miner went 2-for-2 with a sacrifice fly in the fourth and an RBI triple in the third. Dill is working with Avery in an effort to prepare him for the upcoming Frontier League season and the instruction seems to be translating on the field. For the Power, a win over a first-place team is always something to build on, especially late in the season. Nicholas Ivone had the most success at the plate for Washington (8-4) going 2-for-3. Yuta Kikukazi (0-2) got the tough loss after allowing two runs over five innings pitched. The Canada A’s rallied late to beat the Oregon Lumberjacks, 3-2, in the second game of the day. With the win, the A’s ended their four-game losing streak while also ending the Jacks’ five-game winning streak. Trailing 2-1 in the bottom of the sixth inning, Tyler Post led off the inning with a double to the left-center field gap off Matt Kaster. After a pop out, Jovany Felipe tripled off the base of the wall in dead center field, scoring Post. Giovanni Leon followed with a line drive RBI single into left field to bring in Felipe for the go-ahead run. Taking a one-run lead into the seventh, Michael Pope allowed back-to-back singles to start the inning. But the right-hander battled back to then get consecutive strikeouts and finally a groundout to end the game and earn the save. The Lumberjacks held the lead for most of the game, but just didn’t do enough at the plate throughout to hold on. As a team, they struck out 17 times, including eight times in a row between the third and fifth innings. A’s starter Scott Harkin, who took a no-decision, struck out 10 batters with no walks, and Logan Gillespie, who got the win in relief, struck out five and retired all six batters he faced. Richard Mariano Jr. started for the Jacks and pitched five strong innings of one-run ball. Kaster took the loss after giving up two runs in the sixth over just one-third of an inning. In a game dominated by pitching and defense, the two clubs combined for 11 hits and just one error. In the auxiliary field, the Palm Springs Chill fell to the Toronto Rush, 4-3. In game two, the Coachella Valley Snowbirds defeated the Alberta Grizzly, 7-2 for the Snowbirds’ second win a row. Friday, February 9 is “Canada Day” at Palm Springs Stadium. Those with a valid Canadian ID will be admitted to the ballpark for $3. Game one will feature the Toronto Rush and the British Columbia Bombers beginning at 10:00am. The 12:30 contest will be between the Alberta Grizzly and Palm Springs Chill. Those not in attendance may listen to the broadcast live on CaliforniaWinterLeague.com.